Yes, it feels like Autumn finally has arrived in Texas, but It's still nice enough for tea near my waterfall. I'm using my teacup that I received from The Enchanting Rose's 11th exchange. 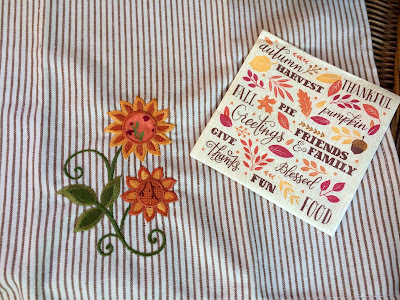 This beautiful tea towel and the pretty napkins are from my sweet friend, Michele, who blogs at The Nest at Finch Rest. I had the pleasure of meeting Michele this past summer when visiting Ohio. She's as sweet and nice as they come! 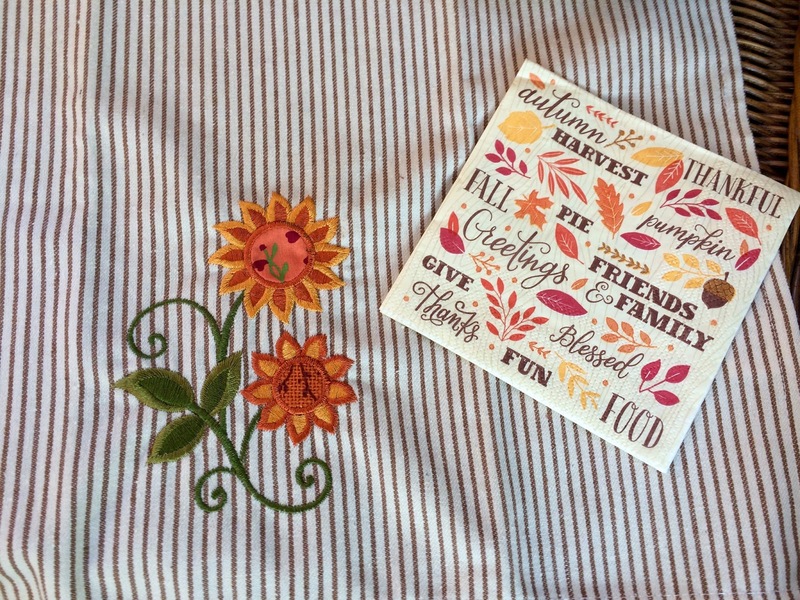 Michele also sent some Harney and Sons African Autumn tea, which is so tasty, and some darling Autumn picks and stickers. Thank you, Michele! My peach Fire King luster ware teacup is so perfect for Fall. My Autumn teapot was an Ohio thrift store find awhile back. This recipe is from Susan Branch's Autumn book. It's a great recipe for Fall, and can even be served for brunch, with some maple syrup. Mix all the ingredients EXCEPT the paprika. Pour into a buttered 9" square baking dish. Sprinkle with paprika. Bake for 1 hour. Serve pudding hot or warm. Corn pudding looks positively delish! Have a good week, Kitty! Hi Kitty, I never had this before but this looks so good and I'd love to make this for Thanksgiving. Thanks for sharing this at C&C with J&J. What a delicious and wonderful side dish for the holidays, exactly what I was looking for!!! happy holidays to you. Such a pretty autumn tea setting. I don't think I've ever had corn pudding before. Lucky you to have the opportunity to meet Michele in real life. I have never heard of this pudding before but it sure does sound like one I would enjoy making. Must give it a try. Your table setting is so pretty for the Autumn weather. What a joy to have met Michele!! Oh how I LONG to have weather like that . . . but alas, I fear that will not happen here for many months now so enjoy it FOR me! The corn pudding recipe is the EXACT one I use every year at Thanksgiving -- mine came from a church cookbook and if I don't make it at Thanksgiving, there is a revolt! Isn't it just the best??? I’m trying to think, and I can’t remember ever having corn pudding. Crazy, right? This is an easy recipe, though, so it’s time to try it! Hi Kitty I am getting all caught up with your blog. I loved your tea exchange package. Especially the wee cup. I am thinking about making corn pudding for Thanksgiving. Hope to see you at the blogger Christmas gathering. Happy Harvest my friend! Love your Autumn tablescape,beautiful teacup and pretty teapot.Hugs! I love all kinds of corn-y thing!! Pudding, bread, etc!! YUM!! :) Pinned! You just made me very hungry, corn pudding and syrup, yum! I love your delightful fall tea table setting, so inviting! You do set the prettiest tables! What a lovely find at the thrift store! One just can't have too many teapots :) Have a lovely week my friend! Have never had corn pudding...sounds Thanksgiving authentic 😉... and it sounds delicious! Kitty, corn pudding would be the perfect side for families who don't like stuffing/dressing. It's hard for me to believe, but some people don't! I like your tea party, Kitty, and the corn pudding sounds very yummie indeed. Dear Kitty: I love that Susan Branch cookbook. I have mine up on the kitchen counter right now. The corn pudding looks wonderful. I think your table setting looks darling. Thanks for sharing. So glad you liked - always fun to put a smile on a friend's face. Funny, the only time I have ever tried corn pudding was on Halloween - I was too sick and the kids were coming over and wee grand to trick-or-treat in our neighborhood. SO hubs went to City Barbeque and got a huge amount of carry-out food, and one of the sides was corn pudding. Apparently it's one of his all time favorites. I have been meaning to look up how to make, and now I needn't! Thanks for sharing your recipe. He will be so glad I made it for him. Hi Kitty, Michele is a sweetheart! I would love meeting the two of you some day!! Your teacup is perfect for fall and the corn pudding sounds delicious! Thanks for sharing with SYC. I just love Corn Pudding and this recipe looks delicious, of course you always make everything look so good! Thanks so much for sharing with us at Full Plate Thursday. Come to next weeks Thanksgiving party on Tuesday at 8:00 am, CST, see you then! I've never had corn pudding either! I love that little teapot, so cute! Have a blessed Thanksgiving. I know it is not the same without your DH, but enjoy your family.